With school starting tomorrow, it's critical to remember to slow down in those school zones and watch out for students and buses. 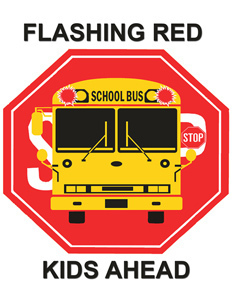 With that in mind, El Dorado Schools are partnering with the Arkansas Department of Education to remind drivers: Flashing Red. Kids Ahead. Educators, parents, school bus drivers and community leaders throughout the Natural State are encouraged to remind Arkansas motorists to obey all traffic laws whenever they are near a school bus. Also, motorists are reminded that it is illegal to pass a stopped school bus whenever its red lights are flashing, as students are present. The fines, penalties and punishment for anyone found guilty of illegally passing a stopped school bus were increased dramatically by Act 2128 of 2005, also known as Isaac’s Law. “As the 2018-2019 school year begins, about 350,000 youngsters around Arkansas will be boarding one of about 7,000 school buses every day,” Gov. Asa Hutchinson said. “Once again, the Department of Education is rolling out its bus-safety campaign. Flashing Red. Kids Ahead. rolls easily off the tongue and is an easy-to-remember slogan. When you see the flashing red lights on a stopped school bus, that means children are crossing the street, and state law requires drivers to stop. We owe our children a future, and one of the most basic contributions to their future is to ensure that they get to school and back home safely. Flashing Red. Kids Ahead. Easy to say. Vital to remember." “School bus safety is important throughout the entire year,” said Jerry Owens, the senior transportation manager at the Arkansas Division of Public School Academic Facilities and Transportation. “It is important for all motorists to know that it is illegal to pass a stopped school bus when its red lights are flashing. Remember: Flashing Red. Kids Ahead." In April, more than 3,200 Arkansas school bus drivers reported more than 850 instances of motorists illegally passing a stopped school bus in one day.